This Honours Board was introduced in 1965, with entries dating from 1953, and kept current until 1983 when it was full up. 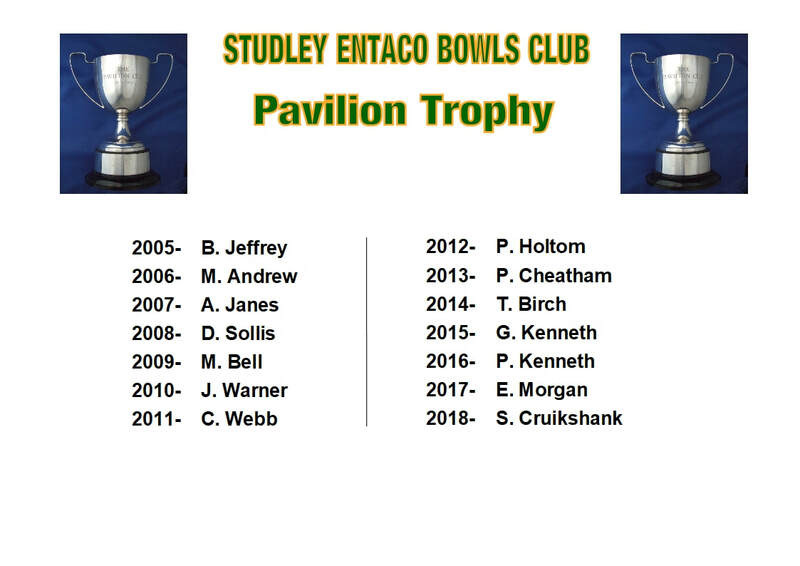 It was rediscoverd in 2010, restored and put back on display in the Clubhouse in 2011. The initial lettering, in 1965, was done by a Miss ILIFFE. 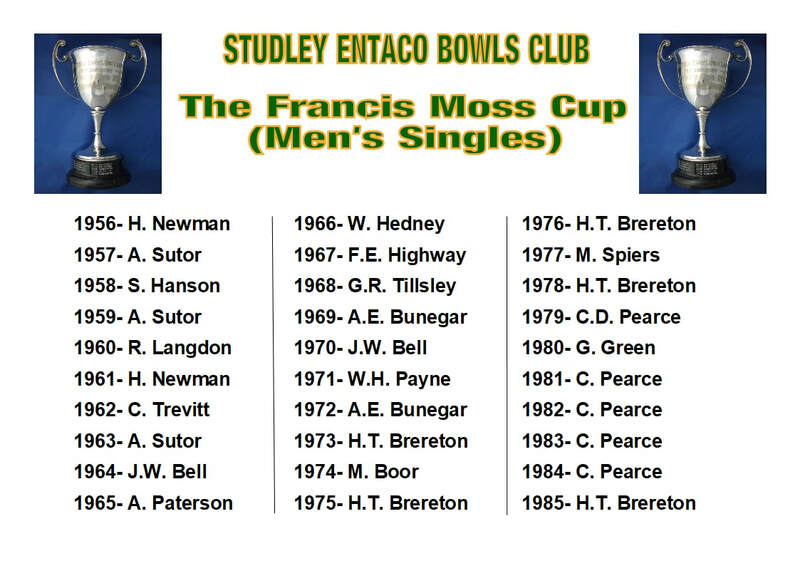 It shows the Men's Singles and Pairs Champions for the period 1953 to 1983. 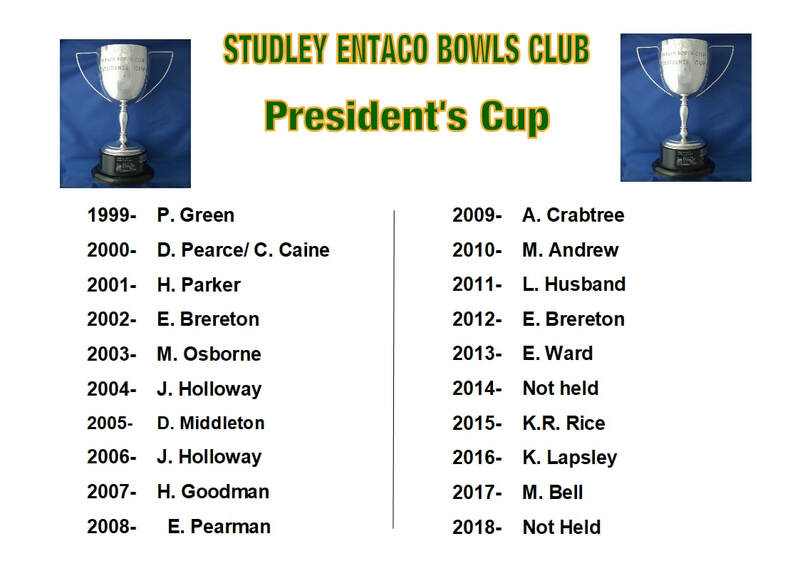 A proposal was made by the Committee and accepted, by a unanimous vote at the 2012 A.G.M., that Eileen and Harvey be awarded Life Membership of Entaco Bowls Club in recognition for over 40 years loyal and continuous service. 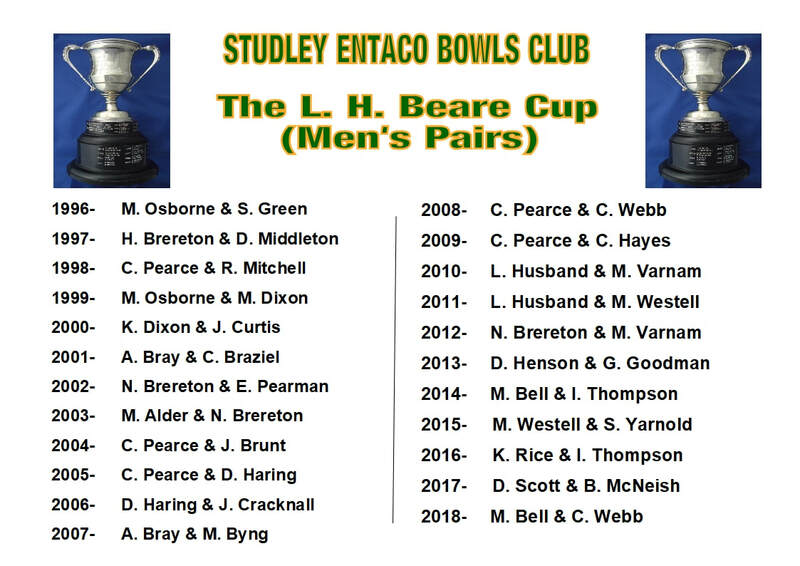 A two bowl singles knockout competition for male club members, played over 21 ends. 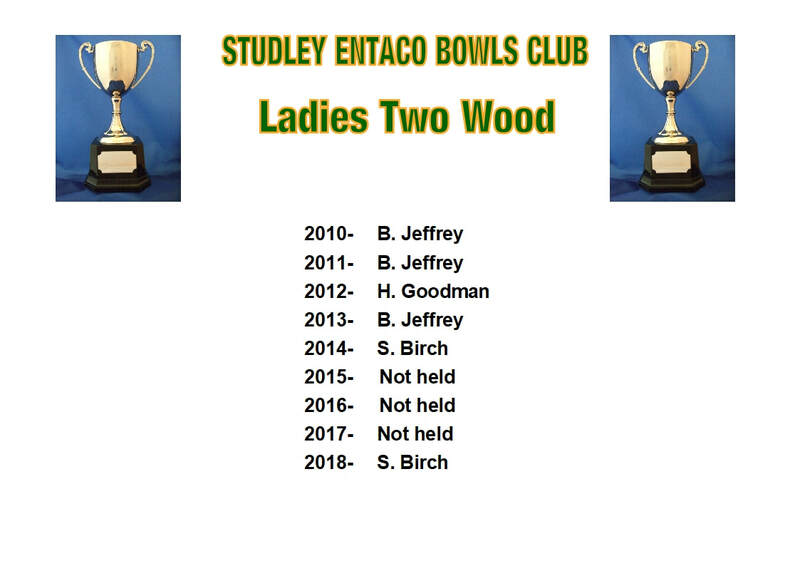 A two wood, Ladies singles, knockout competition, played over 21 ends. 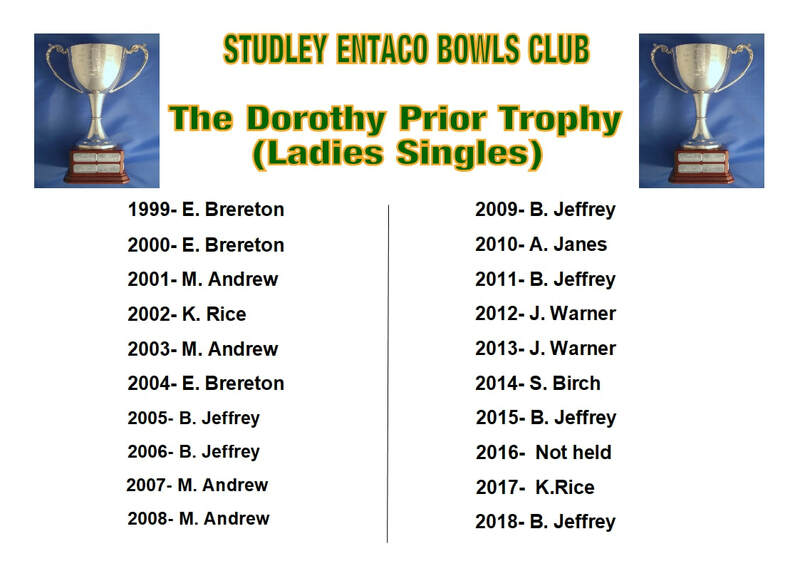 A four bowl, Ladies Singles, knockout competition played to 21 shots. 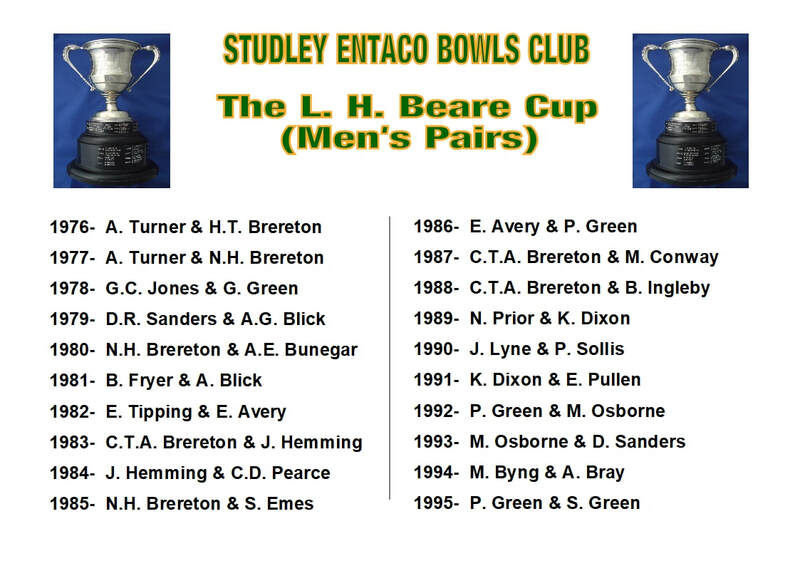 A four bowl, men’s singles, knockout competition played to 21 shots. 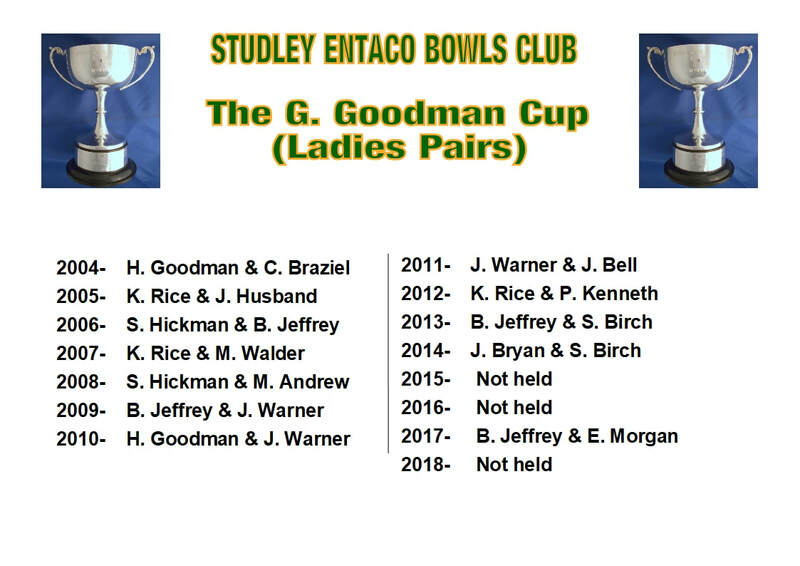 A four bowl , ladies pairs, knockout competition played over 21 ends. A four bowl, men’s pairs, knockout competition played over 21 ends. 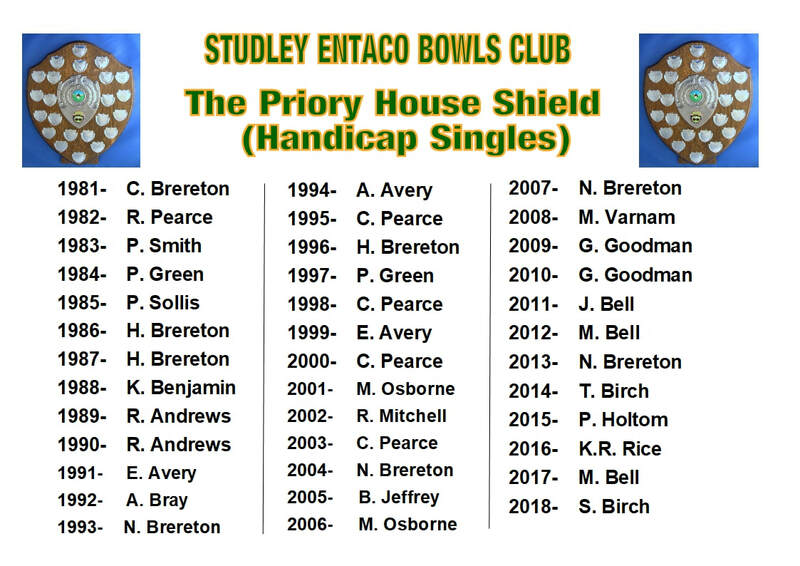 A four bowl, Handicap singles, knockout competition open to both male and female club members. Each game is played to 21 shots with the player starting from their allocated handicap instead of zero. 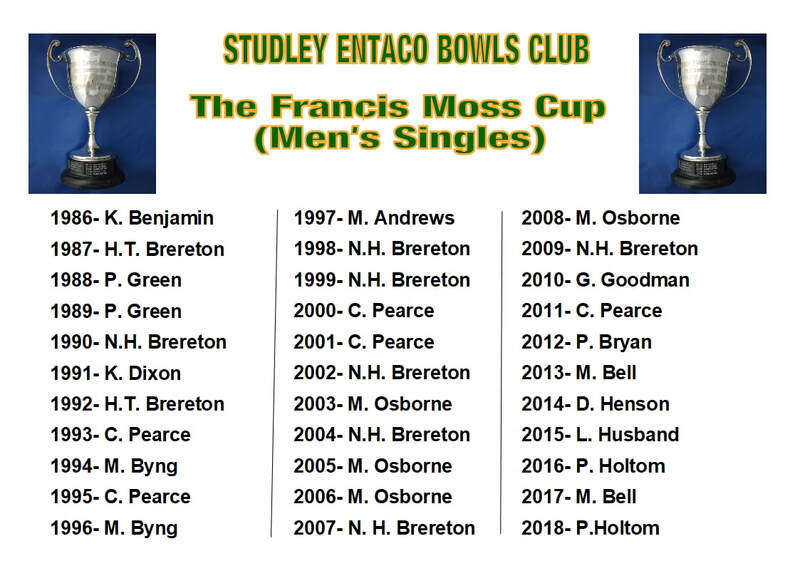 A four bowl singles competition knockout competition open to all male and female club members who have an allocated handicap of +6 and above. Played to 21 shots. A trophy presented to the winner of the annual Gala Day who has accumulated the most number of shots “for” over the games played during the day. 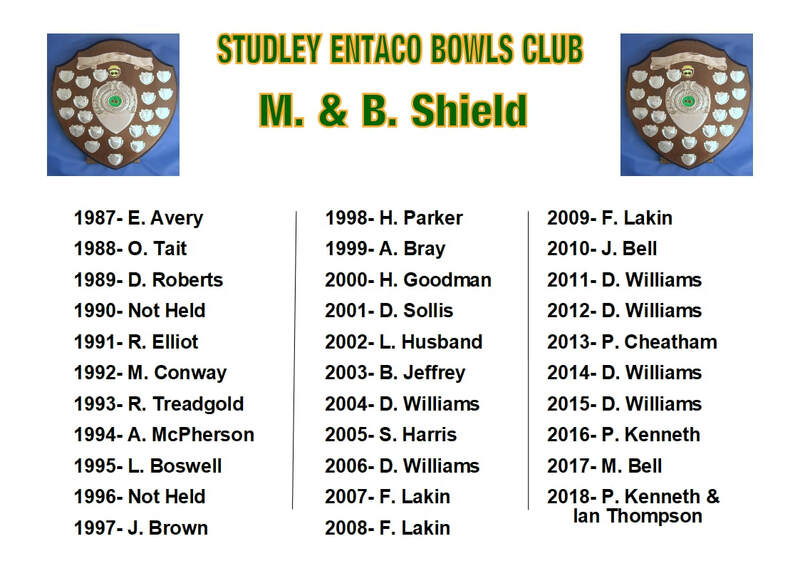 A shield presented to the player with the highest number of ponts accumulated over the season during the Thursday evening club night. 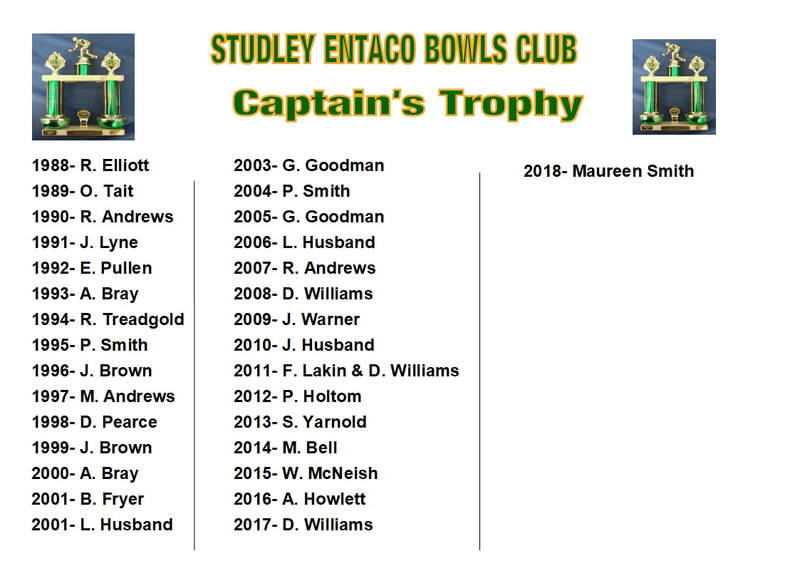 Presented to the person, who in the opinion of the Club Captain, has given strong support and contributed most to club games during the season. 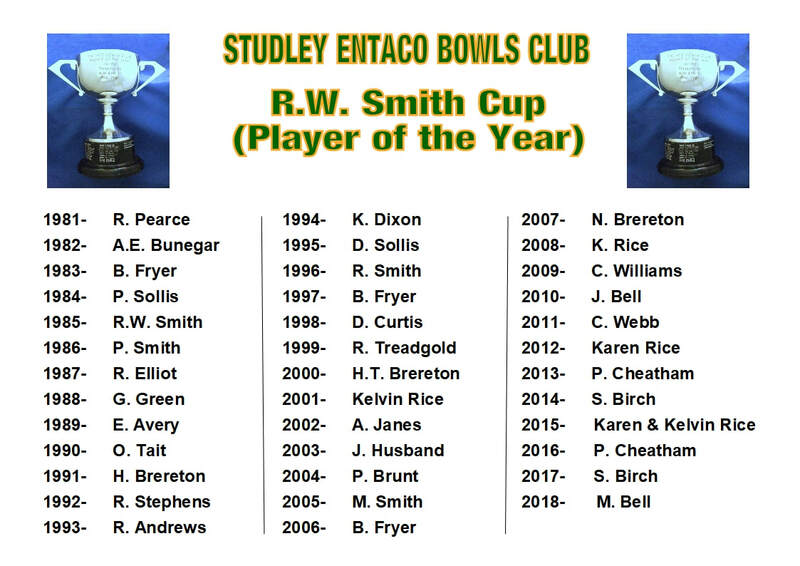 Presented to the Player of the Year; who in the opinion of club officers has excelled in their performance or commitment to the club over the past season.